Hi, I`m Chevy. My buddies and I were found in an auto shop that was just letting us breed indiscriminately. Isn`t that sad? I looked a little rough so Mickaboo took me in and got me to a vet. Since I am a big English budgie, I weighed in at 52 grams. I am eating a varied diet of pellets, Harrison`s mash, veggies, fruit, Nutricakes and bird bread. 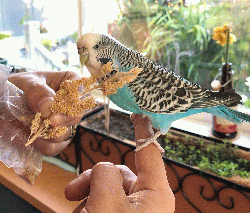 I am semi-tame, will step up for millet and seeds! I am beautiful and healthy and ready to go to a forever home. Won`t you please provide that loving home for me?